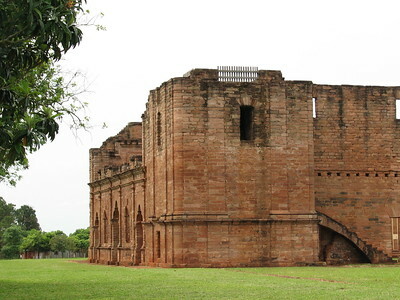 The Jesuit Missions of La Santisima Trinidad de Parana and Jesus de Tavarangue are two examples of small colonies established by Jesuit missionaries in Paraguay throughout the 17th and 18th century. They were built as miniature city-states that integrated the indigenous Guarani populations with Christian faith. The mission of Trinidad was originally constructed in 1706, the intended self-sufficient city came complete with a central meeting plaza, a large church meetinghouse, a school, several workshops, a museum and housing for the local Indian population. The nearby mission of Jesus de Tavarangue was created in 1685. 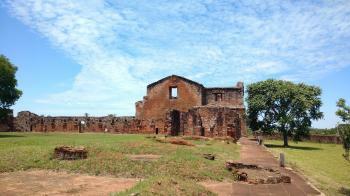 I would probably never have gone to Paraguay if this site hadn't won a separate place on the World Heritage List. As stated above, it represents the same heritage as the missions just across the border in Argentina and Brazil. However, the Jesuit mission of Trinidad probably is the best of them all. There was one other visitor when I arrived at the complex. As a whole it looked well maintained. The site is huge, with a cathedral-like church as the central point. There's another church on site - there were two cemeteries and two kinds of housing as well. Always one for the missionaries and one for the natives. Not really utopia after all, wasn't it? The Trinidad church still has great sculptures. Despite its partly ruined state, one can easily imagine this to be a classical catholic church. Even the crypt and the baptismal font have survived. The site in general looks very peaceful. The grounds are covered with little white flowers, like snow flakes. Its setting reminded me a lot of another outpost WHS, the Buddhist Vihara at Paharpur (Bangladesh). About 11 km down the road lies Jesus de Tavarangue. This site looks if it has a different layout from the others, or it might be that much of the housing has gone. The only large monument still standing upright is the colossal church. Entrance to the sites costs 5000 guaranis each. Small denominations of Argentinian pesos are accepted too, but you will get the change in guaranis. I visited both locations on a half day trip from the Argentinian border town of Posadas. A local taxi driver who I'd hired for the day drove me there. The border crossing in and out of Paraguay earned me four more impressive stamps in my passport, but was without any hassle. 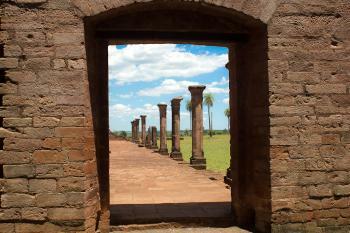 One can lament the quirks of the Unesco process where a site like the Jesuit Missions of the Guaranis gets inscribed twice: once for Paraguay and once for Brazil and Argentina. To me and others the separate inscription was a welcome reason to venture into Paraguay for a day trip on my route from Posadas to Puerto de Iguazu. In the morning I had flown into Posadas from Buenos Aires. I dropped my luggage off at the main bus station in Posadas and then jumped onto a local bus to Encarcion in Paraguay. Encarcion lies across the Rio Parana and is plastered with Duty Free shops, courtesy of some crazy tariffs and taxes the Argentinians put in place. From Encarcion I took another bus to Trinidad and visited the great ruins of the Jesuit mission. It’s certainly one of the nicest ruins; I would put it on the same level as nearby San Ignacio de Mini in Argentina. Initially, I had planned to also go and see the other site in Jesus de Tavarangue. Lonely Planet had promised me a collectivo or a cab readily waiting at a junction nearby. But neither of these options materialized. I briefly tried my luck with hitchhiking, but my heart wasn’t in it that day. It was way too warm and I close to a sunburn. Seeing I also needed to cover additional distance to San Ignacio that evening I decided to call it a day and I returned via Encarcion to Posadas. From there I took a bus to San Ignacio. It was the right call, because it turned out that getting back to Argentina is quite time consuming. As mentioned before, Paraguay is heavy in duty free shops and with it scores of Argentinian day visitors. They all seemed to be heading home when I arrived at the border. It took my bus around an hour to make it across the bridge to immigration in Argentina. When I finally had passed immigration another crazy queue formed and I was afraid of spending yet another hour to clear customs. Quickly, though, a friendly Argentinian noted me and pointed out that with nothing to declare I could just bypass this queue altogether. I am not sure going to Trinidad adds all that much on a cultural level. I found that the three sites near San Ignacio cover the topic and the range of sites quite well. But still, the stark differences you will find in Paraguay are well worth the effort. Let’s simply file the separate inscription as incentive to venture a bit off the beaten path. The bus from the airport to Posadas runs via the main bus station. On the bottom floor of the bus station is a place to drop off your luggage (right hand side on the back, a small shop). I would recommend traversing the border by bus as the bus gets prioritized by traffic police and immigration. It seemed to be a lot faster than by car. The bus runs from Posadas main bus station and will drop you off twice, once for each immigration. If you miss one bus, you can jump into the next bus. For the Paraguayan side, though, I couldn’t figure out where the stop was and ended up walking to the city center. Not recommended so ask before you get off where they will pick you up again. You can exchange money (and you need to as Argentinian pesos come with a huge discount) at the border or at the main bus station in Encarcion. I found the rates at the bus station (ask, guy sitting in the shade) to be significantly better than those at the border. Note, that they are quite picky with regards to foreign currency bills, so bring fresh bills. To get from Encarcion to Trinidad you can take the bus at the main bus station (city center). If you like things smooth and easy, taking a cab from the border seems the easier choice. I don't know how much it would cost, though. If you plan to travel on, going to the Argentinian missions is the logical choice. You can either travel by bus from Posadas. Or try your luck and cross the border with a ferry North of Trinidad. At least, Lonely Planet claims you can and I haven't found them to be the most reliable source. If you catch a bus from Posadas (and that holds true all the way up to Iguazu) be sure to check how often it stops. It seems there are express buses and very slow ones. At the ruins of both communities, which are about 12 kilometres apart, you can get a sense of how life must once have been. The focus of both is the church, in each case a huge imposing building that dominates the area. The natives and the Europeans lived separately and their accommodation was on either side of this church… although I’m sure they didn’t let their god come between them. Walking around the Jesuit ruins as a tourist was a strange experience. At both places there were only a handful of other visitors. There were no tour groups, no guides, no information signs and no sound. Far from highways and the local villages, you can explore these ruins by yourself in peace. They are beautiful places – partly for the architecture, partly for the way the colours of the buildings mix with the sky and the forests surround them, and partly for the way that you are able to visit them. Visited this WHS in August 2013. I got there with a private drive from Asuncion to Posadas and from Posadas Argentina Explored the two missions. To my surprise they were very very well preserved. Didn't see that many tourist there and for that I can see they do a good job there compared to many well visited other sites. For me, being from Europe, it was great to see such architecture in the middle of the jungle. WHen I visited they had information in English, and sometimes little English speaking guide. Further it was all well documented with a tourist office which information about the site. I visited the Jesuit Missions of Trinidad in August 2004. The site is accessible from the nearby city of Encarnacion (about 45 minutes) by any number of busses (about 50 cents United States) traveling frequently on the paved highway to Ciudad del Este. From the highway it's about a 10 minute walk to the site on a well marked road. Food and drink are available from roadside stands. Entrance fee is less than 50 cents in United States currency and there were only three other visitors. A hugh roofless baroque Jesuit church that would not be out of place in a major European city dominates the site which has been cleared of any remains of the jungle that once surrounded it. The carvings of the statues, the pulpit, the baptismal font and on the walls are stunning in their beauty and amazing in that they were done by the Indian craftsmen gathered into the mission by the Jesuits in the 17th century and have survived over three hundered years of exposure. The original decorated stone floor is still visible and there is a crypt under the church into which visitors can descend. There is also a watchtower which you can climb to get a beautiful view of the site and surroundings. Remains of workshops, housing and storerooms also remain. To contemplate the work, artistry and devotion that went into building this complex in the middle of a tropical jungle gives insight into the religious fervor that drove the original Spanish settlers and affected the native Indians in so many ways. There are no paths or explanatory markers, however, though guides (in Spanish)are available in the summer (Dec to March) months. The nearby site of Jesus, about 10 km away on an unpaved dirt road off the highway is also worth a visit. Admission is about 50 cents. It is accessible by taxi from the town of Trinidad or a local bus (about 50 cents)that makes the bumpy, slow half hour trip through hilly farmland about every two hours. This site was never completed and has been partially restored and is equally beautiful in its workmanship and setting. Originally a third Paraguayan mission was proposed (Santos Cosme y Damian), but this one was withdrawn after the ICOMOS evaluation reported that it should be omitted. Guarani: The missions were built as miniature city-states that integrated the indigenous Guarani populations with Christian faith. Recommended for combination by AB: AB Eval 1993 - "That the inscription of this group of properties on the List be referred back to the Government of Paraguay, who should be invited to give consideration to resubmitting this nomination (omitting Santos Cosme y Damian) as an extension of the existing joint Argentinian-Brazilian inscription, under the title "Jesuit Missions of the Guayra", and the redefinition of the buffer zones. " The recorded decison was "The Committee inscribed the site on the World Heritage List under criterion (iv). The Committee invited Brazil, Argentina and Paraguay to consider a joint inscription of the Jesuit missions on their territories. The Delegate of Brazil would welcome a joint conservation effort and announced that such an initiative was being taken in the context of MERCOSUR."